The “Manor “of Perkasie was one of several in Bucks County and contained 11,462 acres. Laid out and surveyed in 1708, it embraced most of Hilltown and Rockhill Township. William Penn’s daughter married Thomas Freamer and on November 18, 1735 they granted 200 acres to John Lacey. This tract covers the land from the Branch Creek to about 100 feet of Ridge Road and between Market and Elm Streets. On Oct 20, 1759 the Lacey sons sold their 200 acres to Jacob Stout and he soon erected for himself a large stone dwelling at Fifth and Spruce Sts. In the winter of 1777-78 when the British were in control of Philadelphia a troop of 56 Dragoons visited the Stout homestead and quartered themselves for the winter making themselves right at home by eating all the family had and feeding their horses from the Stouts’ well supplied store of hay and grain. The early settlers of this family did not care to participate in the war but made their contribution by furnishing supplies to the American troops. During the Dragoon stay, the Stout family buried tins of smoked meat that they later delivered to the troops stationed at Valley Forge. Jacob Stout died in 1779 and is buried in a small plot near 8th and Chestnut known as the Stout Burial ground. In 1853 the railroad only extended from Philadelphia to Fort Washington. It was decided to extend the line to Bethlehem so they began building the tracks from both ends at the same time. Also that year they began digging the tunnel through Landis Ridge. The first contractor to start digging the tunnel gave up the contract after only going 600 feet into the hill when a cholera epidemic stopped the work. It was not until 1858 that trains could travel from Philadelphia to Bethlehem. Samuel Hager built a stone building at 7th and Market St and started a lumber, coal and lime business. The business was not successful and the store closed. The building was used as a knitting mill and in 1868 the building was converted into a general store with the railroad station on the second floor. In 1871, proper roads opened travel to neighboring towns and the Perkasie & Bridgetown [present day South Perkasie] Turnpike was laid out. 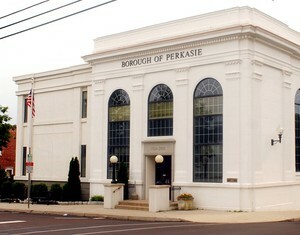 Perkasie continued to improve and on May 10, 1879 the Court of Common Pleas granted the Petition for Incorporation to the 68 residents of Perkasie. At that time, Perkasie covered 1,640 acres. Merchant’s dealers and farmers made it a real trade center and year after year the railroad business increased until the business transacted made Perkasie the third-largest station on the North Penn line. By 1891 there were 22 trains, 19 of which stopped in Perkasie. In 1871 the first Post Office opened at 7th and Market Sts.. In 1880 the first newspaper (The Central News) was started, the forerunner of today’s News-Herald. In 1881 the Grand Bazaar was opened in the Opera House at 4th and Walnut Streets, the first store in Bucks County to sell for cash only-no barter. It was in this year that the stage line between Bucksville and Sellersville made two stops in Perkasie, one in the morning and one in the afternoon. In 1892 the Menlo Park Assoc. was organized and purchased about five acres consisting of the present day Menlo Park triangle grove area and the hillside along the creek. In 1892 the first Borough school house was built at 5th and Arch Sts. and also that year the first of many cigar factories was opened. The Bolz, Clymer and Co. manufactured 150,000 cigars a month to be shipped to Honolulu. In 1895 the first church, St. Stephens German Reformed Church, was built in a cornfield at 6th and Arch St. In 1895 Perkasie had water mains in several streets in town. In 1898 the Quakertown Traction Co and the Inland Traction Co. began to operate a trolley line through Perkasie. In 1899 Perkasie built its electric power plant on Seventh St and we had electric lights in our streets and homes. In 1881 Perkasie had 13 kerosene lamps in the streets and they paid Frank Ott 12 cents per night to light them and then extinguish them. From these humble beginnings, Perkasie has grown to a community covering 15,034 acres or 2.67 square miles with over 8,000 residents. “Postcard History Series: Perkasie, PA” by Ivan J. Jurin, Arcadia Publishing. Copyright 2008. Available for sale at Perkasie Borough Hall. Do you know of a book about Perkasie that can be added to the Borough’s list? Send us an email with all information possible, including where it can be purchased. 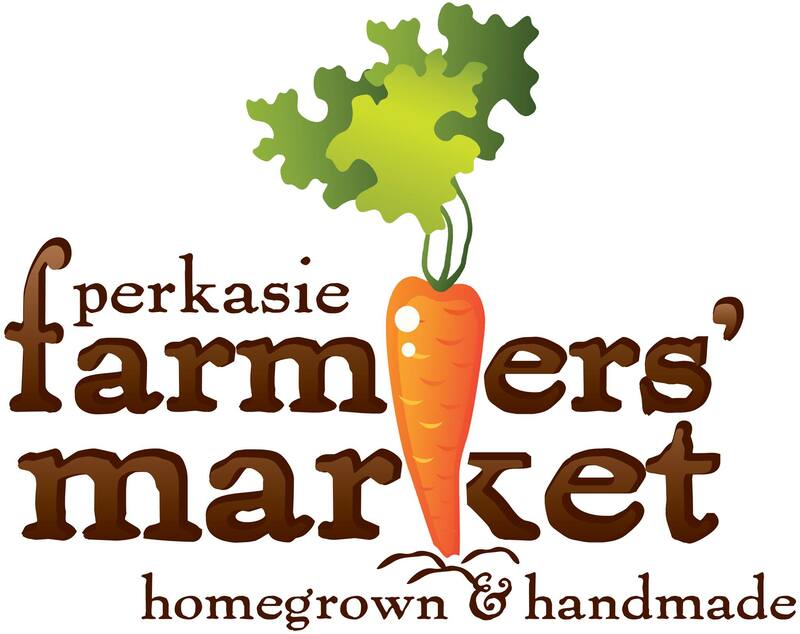 Visit the Perkasie Historical Society at http://perkasiehistory.org/.